Xenia Wiest was born on 8th of february 1984 into a musician family in Moscow. Her mother is a violin teacher and her father a Jazzdrummer. In 1993 the family immigrated to Germany, which became their new home. 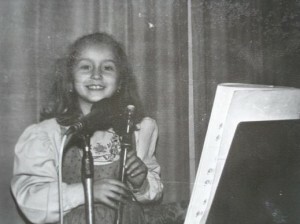 She started to develop her interest in music and art quite early which is not surprising, because her parents used every possibility to take her out to theaters, operas and museums. So she started playing piano and concert flute. She also sang in a choir where she had many opportunities to participate in operas of the State Theatre in Braunschweig like “Tosca”, “Midsummernight’s Dream”. Her biggest success was to sing the First Boy sopran- part in Mozart’s “Magic Flute”. Xenia Wiest started taking jazz-dance and ballet classes at the same time. At the age of 14, she finally decided to become a professional ballett dancer. She made her first steps in a private school “Academie de danse“ in Braunschweig with her teacher and close friend Marie-Francoise Gery. When she was 16, Xenia joined the John Cranko School in Stuttgart where she graduated in 2003. In the same year she received her first engagement at the Deutsche Oper Berlin followed by a guest contract as a soloist in Theatre in Görlitz. Since 2004 until 2014 she has been working with Staatsballett Berlin under the direction of Vladimir Malakhov. Since August 2014, the company is directed by Nacho Duato. In the past 10 years she has had opportunities to work and dance ballets of world famous choreographers such as George Balanchine, Maurice Bejart, William Forsythe, Mauro Bigonzetti, Angelin Prejlocaj and Marco Goecke. Ballet choreographies is another passion of hers, apart from dancing! She presented her first work in the ballet evening for young choreographers “Shut up & Dance“ in 2005. Because of the big success and popularity among the audience, this event was held again in 2007 with the cooperation of the famous Berghain Club in Berlin and in 2010 at Komische Opera Berlin. Since then, Xenia has created many choreographies and commissioned works for dancers all over the world. Furthermore, Xenia Wiest is trying to integrate and explore dance in other fields. This can be seen in projects like Berlin Fashion Week 2010 and advertisement for NIKE Look Book 2013. In life I strive after constant learning and personal progress. Furthermore my aspiration is to value the small things that surround my every day life.